Buffering made the challenge much easier this year. I had time to prepare three or four posts before April 1, and while I never got that far ahead again, it was enough that I was able to stay on time. I think almost always I had at least one post for the day up by 9:00 PM the night before (Pacific time; midnight Eastern time). This was mostly because I get up early and wanted to make sure they were live before I went to bed. Not that I often get to bed by 9:00 PM, but that was the thought. Slightly more posts than previous years (34 this year, 28 last year and 32 the year before). About 36,583 words, a little lower than a couple years ago (about 38,000), somewhat more than last year. The most common topic in this challenge was ‘graded items’, magic items with multiple powers assigned at different grades (measures of power). I suspect that after review and revision the topic will form the core of another book. Like Polyhedral Pantheons there’s a good chance a small part of the book will explain the processes and much more of the book will be spent on gameable examples. Somewhat to my surprise I didn’t actually create many such examples during the challenge — they’re quick and easy, but I had bigger thoughts to write about. Another major topic this time around was some cartography techniques regarding how to draw mountains. Rounding the list out were a few posts about encounter design and development, and the data capture and encoding process I use in creating the Echelon Reference Series (and how I think I’ll be doing it over, better… again). A pretty satisfying run this year. Buffering made a huge difference, even being a single day ahead gave me some grace when I was pressed for time. Having two evenings a week consumed by judo makes this pretty important. 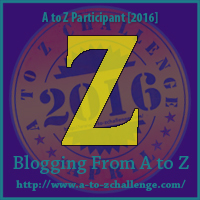 Okay, enough A-Z Challenge for this year, time to get back to work. 2016-04-20 Q 1,396 Quirk, Flaw, Curse: What’s the Difference?